If you feel the same as me about the two-game "regular season" series last week between the Oakland Athletics and Seattle Mariners in Japan, you recognize today as the true Opening Day of the 2019 baseball season. While I have no qualms with special series overseas, I do feel that having all 30 teams beginning their season on the same day is a sacred rite of passage. While all teams technically did play today, it's strange to think that the Mariners already have a 3-0 record. Hell, I'm just happy baseball is back so I'll stop complaining for now. I'm really excited for this season and for a change I'm actually into the side-patch that will be worn for year's All-Star Game which will be held in Cleveland for the first time since 1997. I'm probably going to pick up the cap that the San Francisco Giants will wear even though I'm still not a fan of the patch being on the right side due to the New Era flag placement on the left. I know it seems like I'm being a curmudgeon about this but having embroidery and patches on all six panels of the cap kind of gives off a NASCAR vibe that I'm unsure of. No one asked my opinion but I think MLB should revisit the All-Star Game patch implementation from the 2015 All-Star Game cap. I love how it incorporated the MLB batterman similar to the 2009 "Inaugural Season" New York Yankees hats that I've unscrupulously hoarded so many versions of over the years. That rear patch is still so cool to me ten years later and I wish MLB did something similar for their 150th Anniversary logo instead of slapping what looks like a Brother P-Touch label maker creation onto the right side of the cap. Hopefully they have something interesting lined up for the All-Star Game which brings us back to the topic of Cleveland! This week's Fresh Fitted Friday selection is the on-field cap that the Cleveland Indians' South Atlantic League affiliate Columbus RedStixx wore in 1999. The sweatband tags and satin taping are clearly from the late 1990's but I'm lucky that it is easy to put an exact year on this cap as the New Era flag appeared on RedStixx caps in 1999 and it seems the team switched to a white and red pinstripe cap in 2000. You probably noticed the MLB "Genuine Merchandise" tag on the sweatband but that's not even the weirdest thing about this cap which would be the fact that it's got a Chief Wahoo embroidered on the back rather than the MILB batterman! Folks, if this isn't an April Fools post, I don't know what is. Looks like the 'Toast really found a way to bring it all home, y'all. I'm currently in search of images of cards from the 2000 Multi-Ad set so if anyone out there has leads there, I'd be much appreciative. I'm mostly interested in seeing if I'm right about the hats changing that year but I'm also very curious to see the Brien Taylor card from that set as he's one of the most infamous minor leaguers ever as far as I'm concerned. 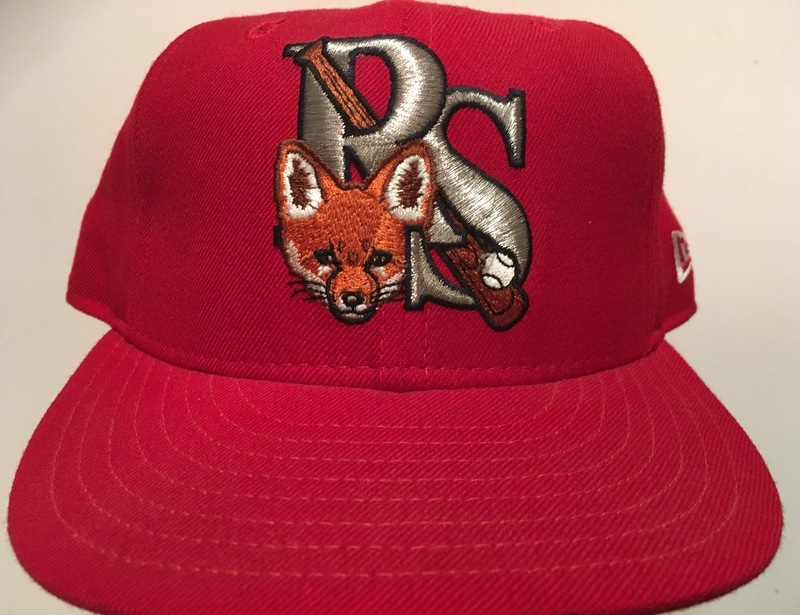 I've mentioned this a bunch but I'm not really a big fan of red caps so this one is going on the Trading Block because I'm sure someone out there is looking for a rarity such as this one and is willing to part with any of the caps on my Wish List. 2018 Lexington Leyandas - Fresh Fitted Friday!!!! 2004 Lakewood BlueClaws - Fresh Fitted Friday!!! !